You Can Do What With What? Holy Crap, That’s Inspiring. Remember Angelina Jolie making headlines when she publicized her BRCA gene test results? Well, our scary-smart new buddies at Biosearch make the kits used to perform those kinds of tests. Some companies make car parts. Biosearch makes custom oligonucleotides. Say whaaaat? Call ‘em oligos for short. Basically, they’re single strands of DNA that Biosearch custom-creates based on whatever pattern the customer requests (e.g. AGTCTGGAC). Bonus points if you remember what those little letters mean. These custom oligos can then be used to discover some pretty amazing stuff. If you wanted to map your personal genome, Biosearch might be the one making your test kit. Or when winemakers need to make sure their vino isn’t spoiled (spoilt? ), they turn to Biosearch’s tools. The list of applications goes on and on. DNA testing in murder cases. Screening the air for biological warfare threats. It’s the stuff of the future, we tell you! Biosearch pioneered this dope technology back in ‘83, and they wanted to celebrate their big 3-0 with swagger. So some real scientists (them) called some brand scientists (us) to do their thing. And boy, did we do it. Existing biotech advertising made it easy to know what not to do. But we wanted Biosearch to really stand out. To be taken seriously. To flip biotech advertising on its head, the same way they flipped genomic discovery on its head decades ago. Biosearch’s oligos enable scientists to see DNA through a completely different lens – in their words, they illuminate the unseen. And then, this happened. DNA + pinot noir = microbe-free deliciousness. 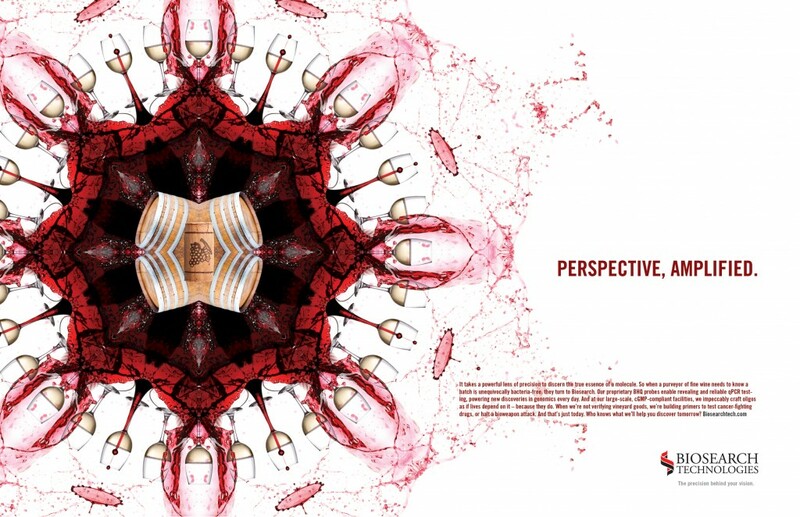 The kaleidoscope works for a lot of reasons, aside from offering new perspective. It implies perfect symmetry and precision (Biosearch’s #1 attribute). It’s beautifully eye-catching and looks nothing like the competition. And the idea of multiplication was a natural fit, given that Biosearch can create thousands of identical oligos in a single day. (We swear it makes sense if you understand nerdy things like oligos and qPCR. The first ad recently launched in The Scientist magazine, and we’ve got more kaleidoscopes in the works. Nerd on, playas. It takes a powerful lens of precision to discern the true essence of a molecule. So when a purveyor of fine wine needs to know a batch is unequivocally bacteria-free, they turn to Biosearch. Our proprietary BHQ probes enable revealing and reliable qPCR testing, powering new discoveries in genomics every day. And at our large-scale, cGMP-compliant facilities, we impeccably craft oligos as if lives depend on it – because they do. When we’re not verifying vineyard goods, we’re building primers to test cancer-fighting drugs or halt a bioweapon attack. And that’s just today. Who knows what we’ll help you discover tomorrow? this is impressively beautiful, and then, holy hotsocks, just damn impressive!